Welcome to Safety Compliant Services. 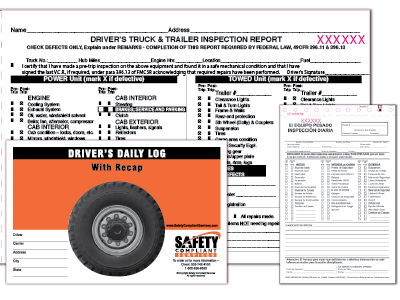 We specialize in Safety Log and Inspection books, making your company compliant with DOT regulations. We have several Safety Log and Inspection books in stock and ready to ship to your company today. Since we manufacture the books ourselves, we’re able to pass these savings on to you. We can also customize our books with your company logo and information on the cover. In addition to log books, we’ve added OSHA approved apparel/vests for your employees. Thanks for considering safetycompliantservices.com for all your DOT and OSHA approved products. If you don’t see what you need, Please don’t hesitate to call. We can produce it for you! Our Safety Compliant forms are DOT approved. Simply order our pre-printed forms or you can customized the forms to include your company logo or information. Our OSHA approved safety apparels include hard hats and safety vests. Find a variety of colors to serve your needs. Customize them with your logo. We are very responsive! Order with confidence and expect quick delivery. If you have any questions, please contact us and we will respond within 24 hours. No middle man to deal with. Our compliance forms are printed by us, which means, we can pass the savings directly to our customers. If you have any questions about safety compliant services and/or our products please call or email us and we will reply promptly to your inquiries. We are located in beautiful Denver, CO and can deliver your products to anywhere in the country.